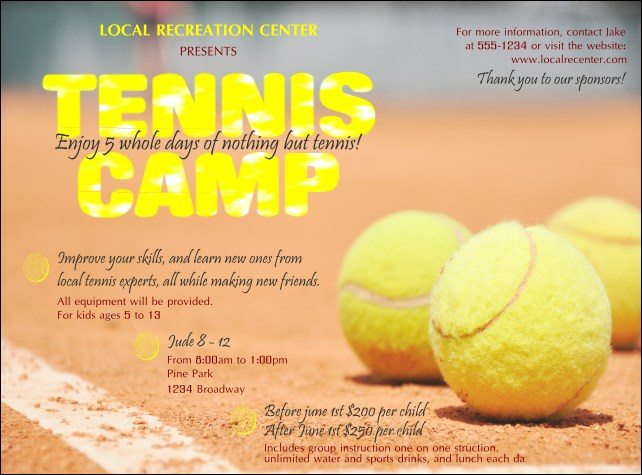 Gain the advantage in your promotional game and advertise with the Tennis Camp Flyer. A rust coloured clay court serves as the background for bright yellow tennis balls waiting for the match. Fill in twenty-one lines for event details on the easy template and we'll ship them your way. From tournaments to camps, find the right flyer for every occasion at CanadaTicketPrinting.ca.